Antrim maintained their 100% record in Division 4 of the Football League as Tomas McCann's 1-9 helped them earn a 2-14 to 0-9 win over Leitrim. 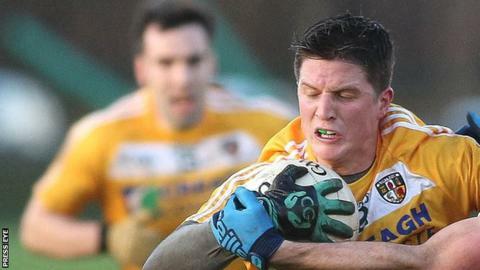 Three Emlyn Mulligan points and two Kevin Conlon scores helped Leitrim lead 0-6 to 0-2 as Antrim struggled. However, McCann's 31st-minute goal turned the game as Antrim moved into a 1-4 to 0-6 lead by half-time. As McCann tagged on a succession of points Antrim took control and Brian Neeson's late goal sealed their win. Neeson's goal was one of his trademark chipped efforts over the keeper. Antrim were forced to make three late changes to their starting line-up as Justin Crozier, Michael McCann and Mark Sweeney were ruled out. McCann's leg injury saw Sean Burke drafted into the side with the Johnston brothers Ricky and Martin replacing Crozier and Sweeney. Burke was among Antrim's other scorers with Kevin Niblock and Niall McKenna also contributing points. Louth are also on a maximum six points after their opening three games as they earned a comfortable 0-15 to 1-2 win over Wicklow.